The internationally acclaimed FotoFest International makes its first appearance in the Middle East. 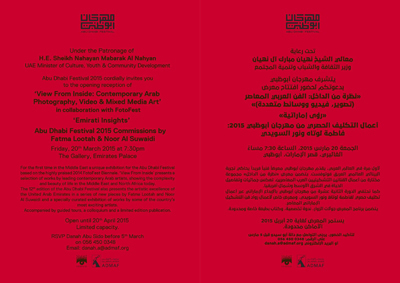 At the invitation of the Abu Dhabi Music and Arts Foundation (ADMAF), FotoFest will present VIEW FROM INSIDE: Contemporary Arab Photography, Video and Mixed Media Art as a special commission and visual arts centerpiece of the Abu Dhabi Festival 2015, the twelfth edition of the festival. With more than 35 leading Arab artists and over 140 works from 12 countries in the Middle East and North Africa, VIEW FROM INSIDE, will take place at the Emirates Palace Gallery in Abu Dhabi, UAE. It opens with a private preview March 20, 2015 and continues through April 20, 2015. As a special commission for ADMAF, founder and organizer of the Abu Dhabi Festival, VIEW FROM INSIDE, is based on FotoFest’s highly acclaimed presentation of leading Arab photo and media artists originally created for FotoFest’s 15th international Biennial in Houston, Texas. With the exhibition, there will be a series of public programs, curator tours and artist workshops. A special colloquium will be done with New York University Abu Dhabi on April 15, 2015 featuring eight artists exhibiting in VIEW FROM INSIDE. A limited edition commemorative book on the Abu Dhabi exhibition will be produced by ADMAF. VIEW FROM INSIDE is joined by an exhibition of twelve Emirati artists curated by ADMAF, Emirati Insights, as well as three 2015 Festival Commissions sponsored by ADMAF. It is the third major exhibition on the Middle East that FotoFest has showcased: the first U.S. presentation of NAZAR (2005), a groundbreaking Dutch exhibition of historic and contemporary Arab photography which later traveled to the Aperture Foundation in New York City; and Kurdistan, In the Shadow of History (1996) which FotoFest originated and traveled with its producer-author-photographer Susan Meiselas.